Wally's Beverly Hills. Photo courtesy of Wally's. Wally’s Santa Monica. Photo courtesy of Wally's. Wally's owners. 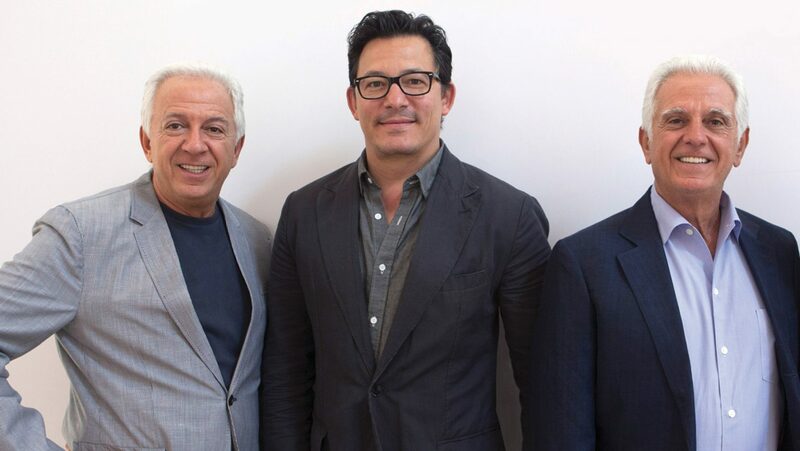 From left to right: Paul Marciano, Christian Navarro, and Maurice Marciano. Photo courtesy of Wally's. Last fall, Wally’s Wine and Spirits, a fixture of the Los Angeles retail wine scene for more than 50 years, closed the doors of its flagship store on Westwood Boulevard. 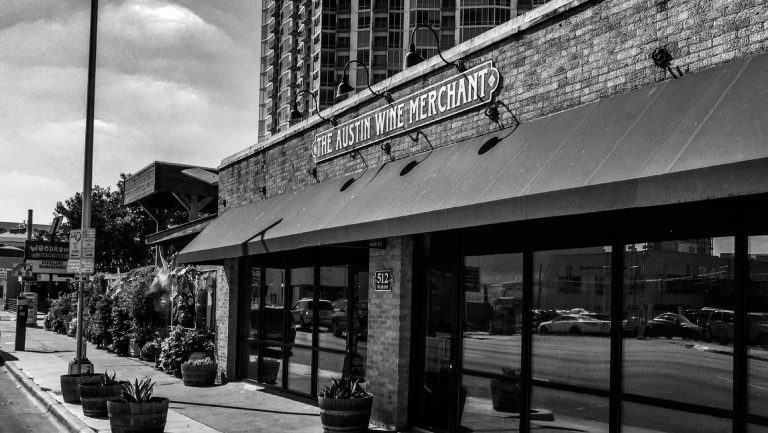 The once-modest storefront had gone from run-of-the-mill liquor store to wine industry powerhouse under the stewardship of Steve Wallace, its founder and former owner. It had played an essential role not only in the cultivation of L.A.’s collector culture but in the shaping of the tastes of Hollywood’s elite. 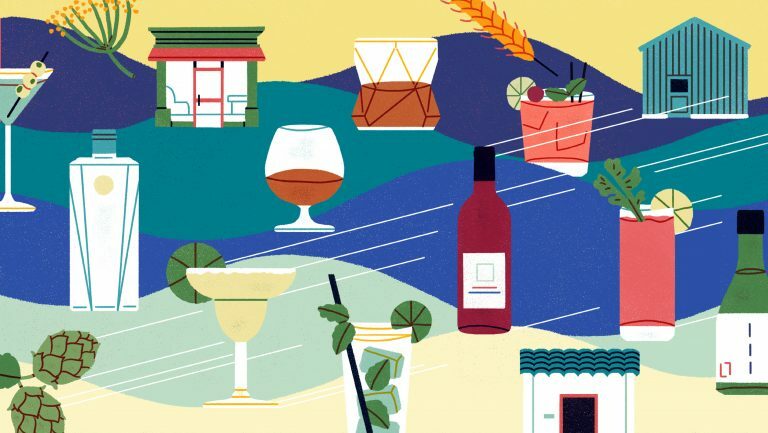 It had abetted L.A.’s wine scene as it evolved from trophy wines and regrettable clichés (think fern bars and buttery Chardonnay) to one of the most robust markets in the country. 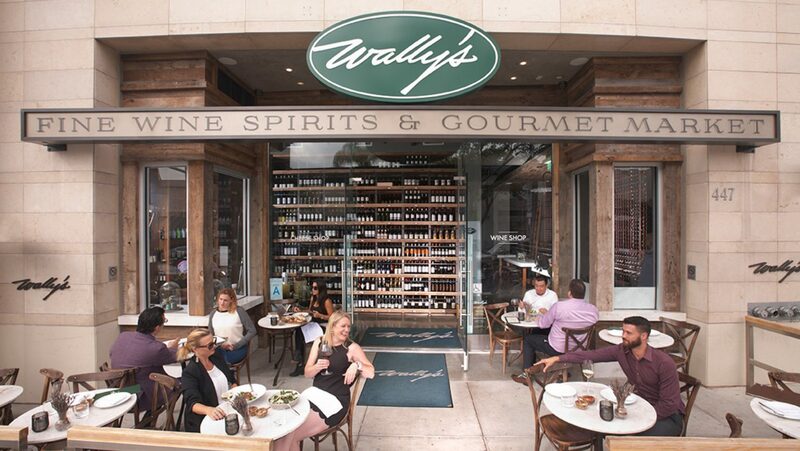 But after half a century, according to its new owners, Wally’s had rendered itself obsolete. This ambition set the stage for Wally’s “2.0,” a huge storefront established in late 2014 on Canon Drive in Beverly Hills—in the middle of one of the swankiest blocks of the glitziest city on Earth. 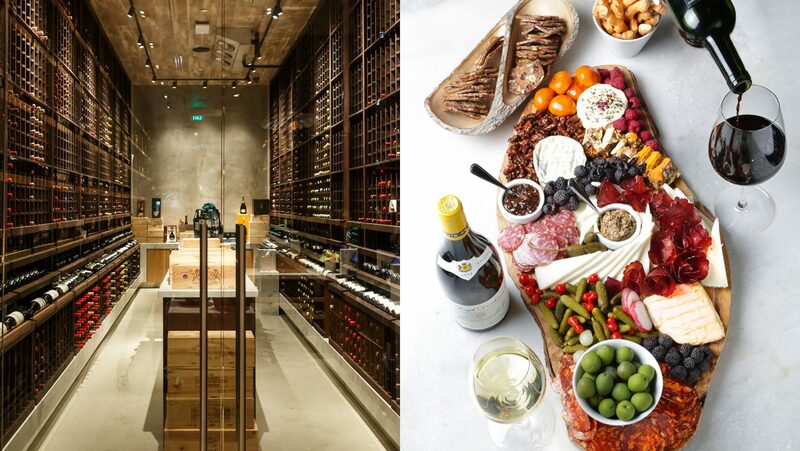 Wally’s Beverly Hills is a hybrid retail, restaurant, and wine bar space that marries the store’s retail roots with the luxury sensibilities of the Marcianos, whose Guess brand had established itself, nearly 40 years earlier, as one of the great progenitors of bling couture. 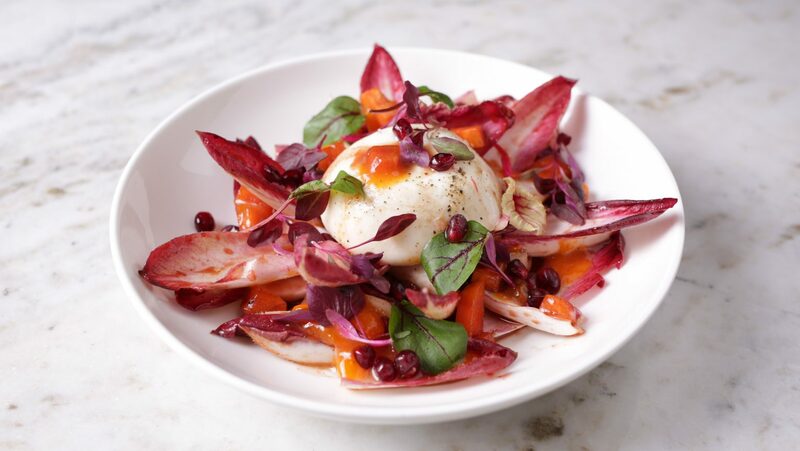 A second space, in Santa Monica, opened late last year. Unabashedly lavish and aspirational, both spaces feel like lures for luxury-minded consumers. The walls are lined floor to ceiling with wine displays, some backlit to give the impression of a temple or shrine, especially at night. 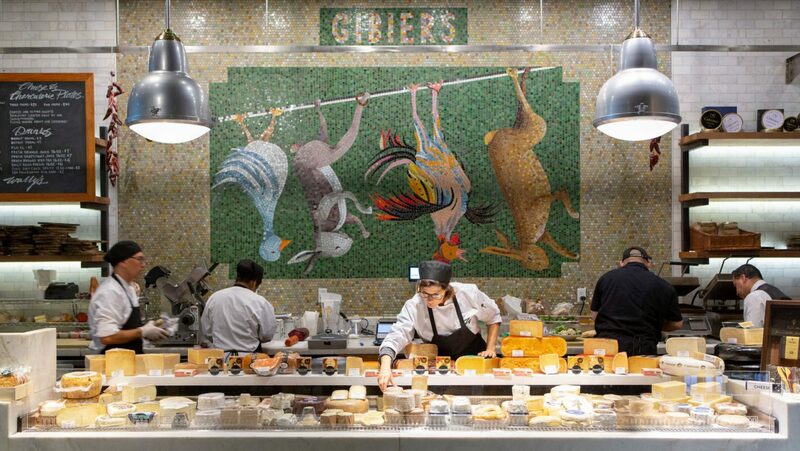 Sumptuous displays of specialty foods, including caviar, truffles (when available), and foie gras (when legal), are prominently featured. There are display cases in which $25,000 bottles of Scotch and Cognac repose like museum pieces. A climate-controlled reserve room contains rare and old bottles. And in the foreground is a grand, backlit white marble bar, with a wall of spirits rising to the rafters. All these elements are organized around a collection of marble tables that are meant to be communal, with strangers sitting next to friends, millionaires next to surfers. The enforced communality is by design, and it’s a built-in feature of the 2.0 experience. 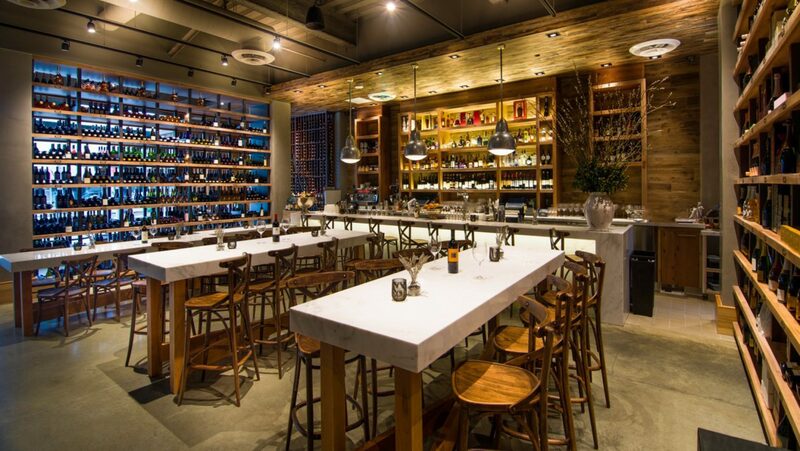 Together, the two shops more than triple the retail space of the original store, but it’s the restaurant concept that’s made the biggest splash: The wine-themed bar and dining room at the Beverly Hills location was mobbed from the moment it opened (the Santa Monica location ramped up pretty quickly, too). 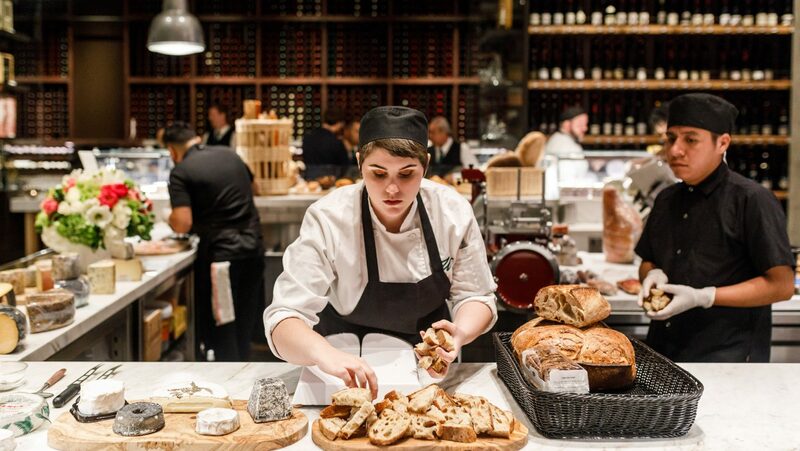 The proprietors expected the first new Wally’s to function as a retailer that served food on the side, but it’s become one of the hottest restaurants in Beverly Hills—one that also happens to sell wine. 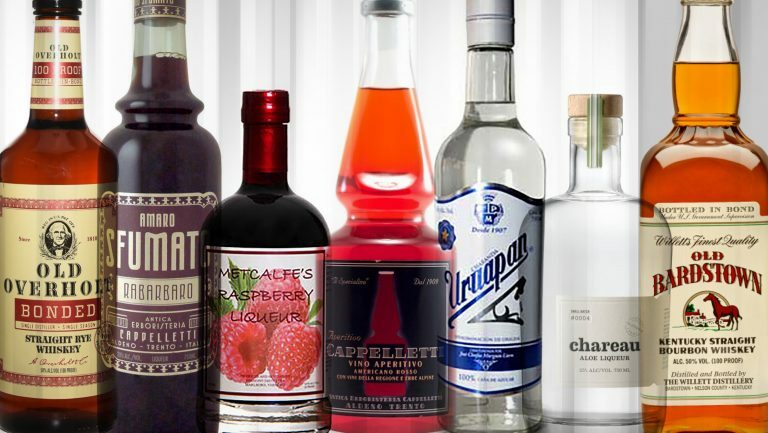 With this development, Navarro and the Marcianos found themselves occupying a unique middle ground in the retail environment: an on-premise/off-premise mashup that California’s lenient beverage laws make possible. Now their intention is to take the Wally’s luxury hybrid concept global. Navarro and his partners never envisioned the new concept as being anything other than top of the line. But the form it would take remained fluid until Navarro, on a trip to New York City, visited Maialino and sat at the upscale-casual Italian restaurant’s communal table. There are 120 wines available by the glass at Wally’s locations at any given time. 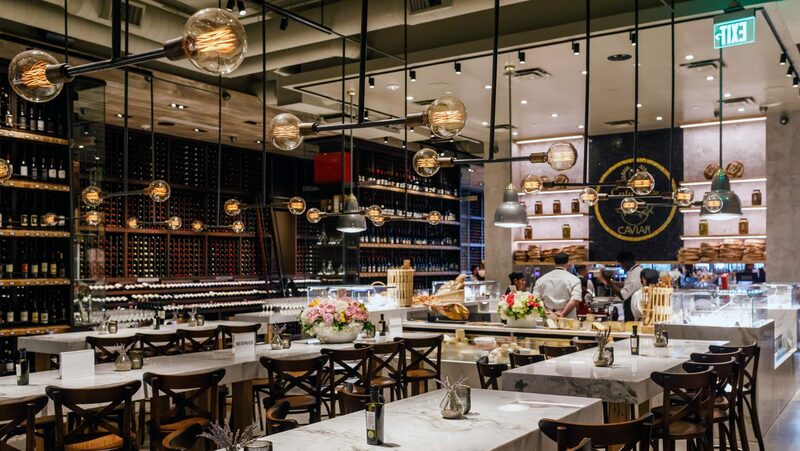 The selection exemplifies Navarro’s desire to mix the upscale with the casual, with BTG prices running from $14 (for a Happy Canyon Sauvignon Blanc) to $599 (for a 2008 Grands-Échézeaux by Domaine de la Romanée-Conti). Guests can order a glass of Prosecco—or a glass of Krug (at the relative bargain price of $39). There are also a number of somewhat rare wines on the BTG list, such as Kumeu River’s Estate Chardonnay from New Zealand ($19) and the red Ao Yun from China’s Yunnan province ($91), alongside icons like Gaja ($69), Opus One ($89), Château Cheval Blanc ($170), Grange ($225), and Harlan Estate ($379). 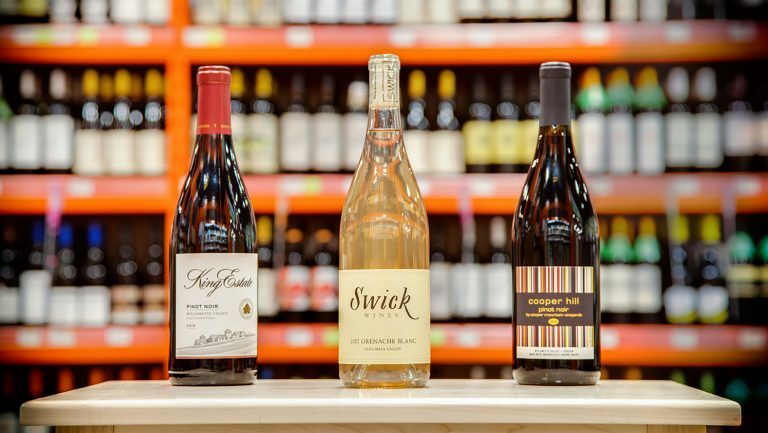 The list pricing at both locations follows a simple formula: $40 above a bottle’s price in Wally’s retail shop (even for high-priced bottles). This comparatively low markup is applied to the BTG offerings as well, resulting in glass pours that are priced at about double cost, rather than three or four times cost. While some in the industry wonder if this approach is sustainable—glass pours are traditionally a high profit zone for restaurants—Navarro doesn’t seem concerned. “People are drinking more of what they want to drink,” he says. “We live on volume, not on percentages.” He also points out that guests are more likely to walk out with a bottle of something once they’ve tried it at the bar. The success of Wally’s hybrid model has not been without challenges. For one, it’s evident that the Beverly Hills space, with its tiny kitchen and the narrow corridor that links it to the dining room, was never meant to churn out 300 dinner plates every night. As a result, the retail experience can be a bit awkward, since much of the shelf space overlaps with the dining area. Shoppers looking to purchase bottles will inevitably interact with diners, whether they want to or not. And while some may be willing to put up with such awkwardness, others may not want to bother. But for Navarro and the Marcianos, there’s no looking back. “They may lose some types of customers who’ll want to shop somewhere else,” says the NAWR’s Wark, “but they’ll get a higher margin on what they sell, and in this day and age, [they] can make up traditional retail by going online in a serious way.” Wally’s also offers a robust platform for anyone preferring to order its products online. The staff at the Beverly Hills location also needed an early, unexpected overhaul. With the proprietors’ original focus predominantly on the retail side of the business, the retail team was staffed more heavily. But within six months of opening, as restaurant sales ramped up and began eclipsing the retail business, adjustments were inevitable. Some retail hires found themselves in unfamiliar territory on a dining room floor and moved on; others went behind the scenes, to the company’s office and warehouse. The restaurant has since been staffed in accordance with its long hours and the rather staggering number of meals it serves daily. 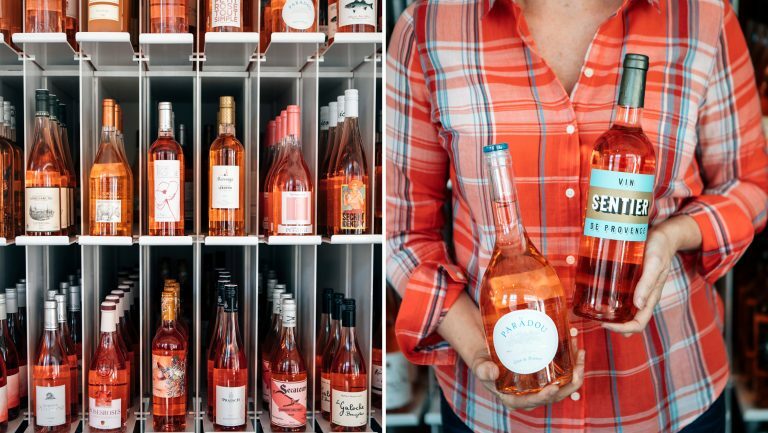 Navarro’s goal, however, is to train employees to adapt to the hybrid model and to ensure that they can cross over from bottle sales to sommelier on the floor and back again. Patrick Comiskey is a senior correspondent for Wine & Spirits Magazine and has served as the chief wine contributor for the Los Angeles Times. His book “American Rhône: How Maverick Winemakers Changed the Way Americans Drink” was published in October 2016.